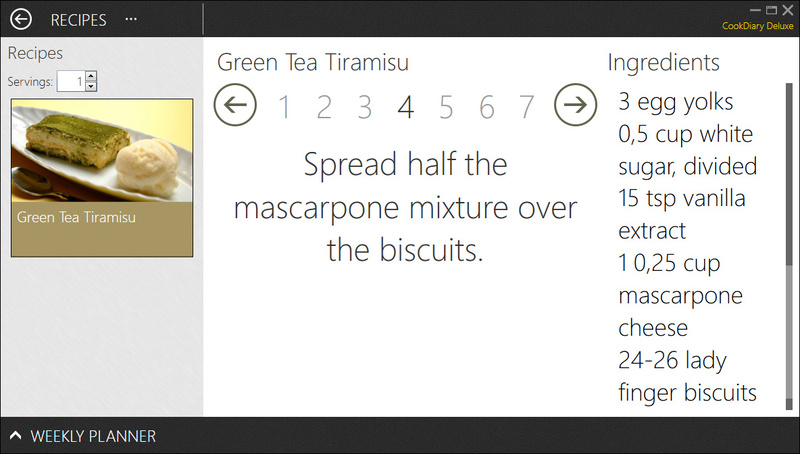 The CookDiary cooking assistant aids your cooking. You can read the instructions and ingredients of your dish in big letters and switch between them with your mouse or keyboard. The current instruction is always clearly visible and visually emphasized. You can also cook multiple recipes at once. Even when cooking big menus you will always know what to do next. Every recipe can be prepared with the amount of servings you desire. For instance you could easily add a single special dish for your vegetarian friend or prepare three starters at once.